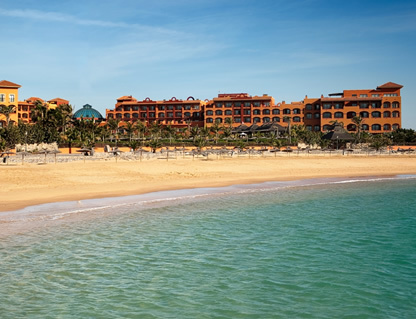 The Sheraton Fuerteventura or to give it its full name the Sheraton Fuerteventura Beach, Golf & Spa Resort Canary Isle, is a 5 star deluxe property set just outside the popular resort of Caleta de Fuste. 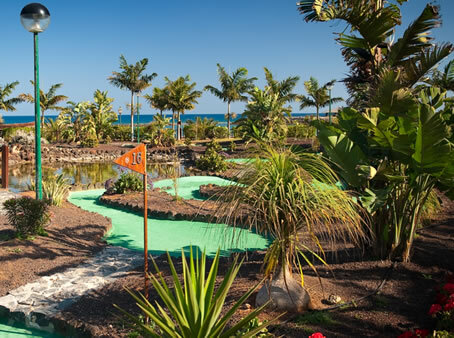 The hotel is situated on the beach front and opposite the islands 18 hole golf course. Shoppers will be pleased to note that the hotel is conveniently close to the resorts commercial centre and cinema complex. 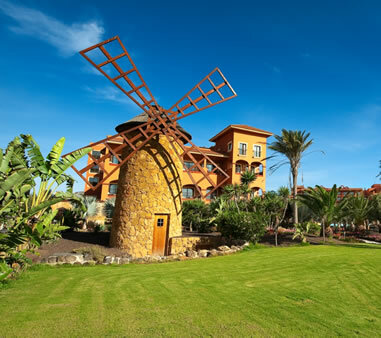 The Sheraton Fuerteventura hotel is located only a 10 to 15 minutes taxi ride from the island's airport. The sumptuous bedrooms have private bathrooms that have separate bath and shower stall and have a hairdryer. The bedrooms have sea views, private balconies, satellite TV, telephone, mini-bar, tea and coffee making facilities, the comfortable Sheraton Sweet Sleeper(SM) Bed, in room movies and 24 hour room service. The hotel has also a range of inter connecting rooms and a choice of junior and superior suites. Guests can choose from bed and breakfast, half board or full board dining arrangements. The hotel has a wide choice of dining options there is the main restaurant for buffet style breakfast, lunch and dinner. The Veranda restaurant that overlooks the pool is Italian cuisine and is open during the day (12 noon to 6pm) the pool bar is open for snacks. 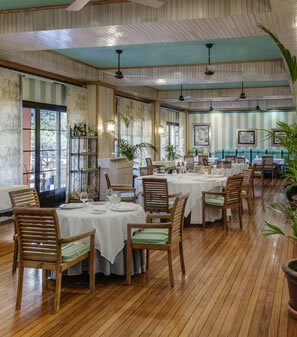 In the evenings guests can pop in to the Faro de Antigua restaurant for a steak and seafood menu or the Wok-N-Zen Pan Asian restaurant. For pre-dinner cocktails the lobby piano bar is the place to be and for night owls the Someplace Else Bar is the venue for live entertainment. 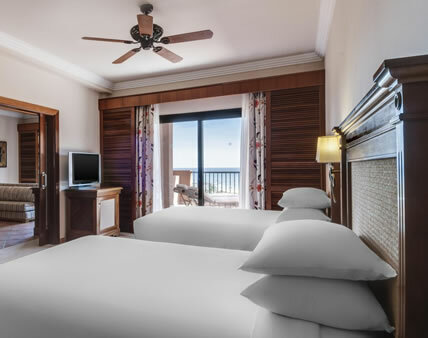 The Sheraton Fuerteventura is air conditioned throughout, it has an array of holiday facilities to suit all the family; there is a tennis court, 2 swimming pools an indoor and a large outdoor pool (both are heated). The hotel has its own Hesperides Thalasso Spa, sauna and steam/bath room and fitness facility. The kids will enjoy their own pool and children's entertainment programme. The hotel reception has a concierge service. Situated near to the hotel is a large commercial centre that hosts a supermarket, several interesting shops and boutiques, a choice of cafes and bars and a zone for teenagers with slot machines computer games and rides, a multi-screen cinema and a bowling alley. The golf course is opposite the hotel. There are plenty of things to do for the more active in the local area, you can play golf, jet ski, windsurf, sail, go mountain biking, scuba dive or go deep sea fishing.